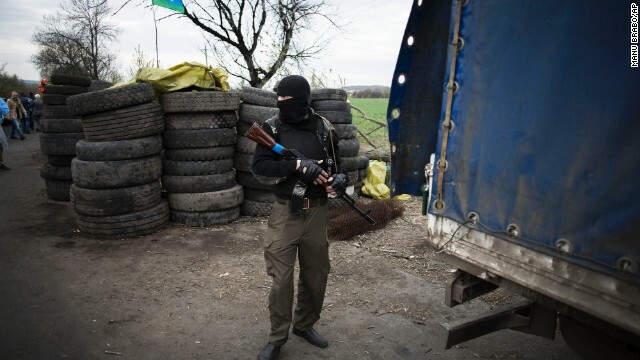 The second phase occurred in early May after the events in Odessa, just ahead of the so-called referendum in Donbass and right after the launch of the Ukrainian army’s anti-terrorist operation. Then it appeared that these republics were receiving some kind of support – some people voted in the referendum and a good amount of the people, though we cannot know for sure how many, joined the separatist forces. Apparently, people thought events were going to follow the Crimea scenario, they would vote in the referendum and then continue to live quietly and peacefully in the region. But that didn’t happen, and then phase three started, which brought a lot of disappointment because people had thought peace was just around the corner and they realized they were wrong. They also realized that the militias are building checkpoints close to civilian homes on purpose, using them as human shields. Therefore, the Ukrainian army's shelling, just like the Russian army’s one in Chechnya, is more likely to destroy a number of civilian homes given their proximity to the checkpoints, which are the targets of the attacks of course. Some Western leaders and experts are convinced the latest round of sanctions, targeting Russia’s energy, arms and finance sectors, are going to hit Russia hard. How do ordinary Russians feel about these sanctions? To my understanding, while the previous sanctions were targeted at specific individuals, they were not able to affect ordinary Russians in any way. These new sanctions are targeting some economic sectors. For example, Russian state-owned banks will no longer have access to Western capital markets. I don’t know to what extent this will affect them, but I can tell you for sure that people don’t feel it on a daily basis yet. I’ve read what economists wrote about this topic and I understand that the sanctions are going to hit the country’s budget really hard. But as far as I’m aware, this is long-term project and people aren’t going to feel its effects today or tomorrow. Some analysts in Washington and Brussels insist that this is the start of a new Cold War. Do Russians agree? At the level of state propaganda, there’s been a cold conflict going on for a while now, since Russian TV has always been used to blame Washington for all its sins and troubles. It’s hard to assess if this is a new Cold War because the situation is different now. Back then, there were two big powers in a bipolar world that had control over a large number of countries. At the moment, Russia is nowhere near as powerful as the Soviet Union, so I don’t know if this comparison is fair. It’s clear that Russia’s relations with Europe and the U.S. are cooling down at the moment, but at the moment we can’t really assess what consequences that will ultimately have. According to the latest polls, Russia’s image in the eyes of the rest of the world has been severely damaged amid the crisis in Ukraine. Are Russians concerned about that? We need to understand that, unfortunately, the vast majority of Russians make their decisions based on the information they get on TV. We know that the Russian president’s approval rating has reached a historical high – around 80 percent of Russians support his policies andare happy about Crimea’s accession to Russia, and so on. But there’ s maybe another 10 to 15 percent of people who are able to critically analyze the consequences of these latest events. So it depends. Are we talking about the reasonable people who are certainly alarmed by the happenings, or are we looking at the 80 percent who are not really interested as sanctions are unlikely to affect them much? One has to understand that the Russian population is strongly divided on this matter, and this ongoing crisis is only making it worse. You’ve followed events both in the Russianand foreign media. What do you think has been lost in translation? You know, I just got back from Berlin, from a big media conference attended by Russian, Ukrainian and journalists from various EU countries. There’s been a long discussion and debate on this issue that concluded that these new conditions of war have blunted our ability to listen to each other effectively. But there’s logical explanation for that. Aside from the propaganda, which is very effective both on the Ukrainian and Russian sides, there’s a lot of misrepresentation of the actions and intentions of the opposite side. Russian journalists working in Luhansk and Donbass can feel uncomfortable around the Ukrainian army or the Kiev government, and that makes it harder for them to clearly understand what the government in Kiev is really up to. At the same time it’s easier for Ukrainian journalists to support theUkrainian army and it’s obvious that it’s not very safe for them to work in the cities controlled by these militia groups – that’s why there’s some strange information about what is really happening in Donetsk and Luhansk being spread in the Ukrainian media. So getting an objective picture of facts during war time is quite challenging. « Previous entryWhat Middle East moderates? It's truly amazing (though not surprising) to see Vladimir Putin deny aiding the Pro Russian rebels once again, yet the whole world can see thousands of Russian troops moving into Ukraine today with heavy weaponry in tow. According to the pro Russian rebels, the Russians are there on "vacation". Yep @ Ferhat and at least 20,000 troops along the border. dont pretent to know russian life but under Clinton owo wolves, the US has been drained dry. Now we have a muslim prez who hates US, we want the out of our infrastructure. Congressional transparency has dropped so fast since the secret operations took over. We have the worst leaders of all time in the history of America! Pray we get TRUMP and jobs not related to the corruption. We need to totally undo the travisities the clintons cause from ravenous greed! You really deserve a big kiss right now. After looking over some of the write ups on your blog, I seriously enjoy your style of writing. It's very informative and you're obviously very knowledgeable in this area. Just how did you gain your skill set? It is almost like you wrote a book on it or something. I’ve been really distracted, to say the least.